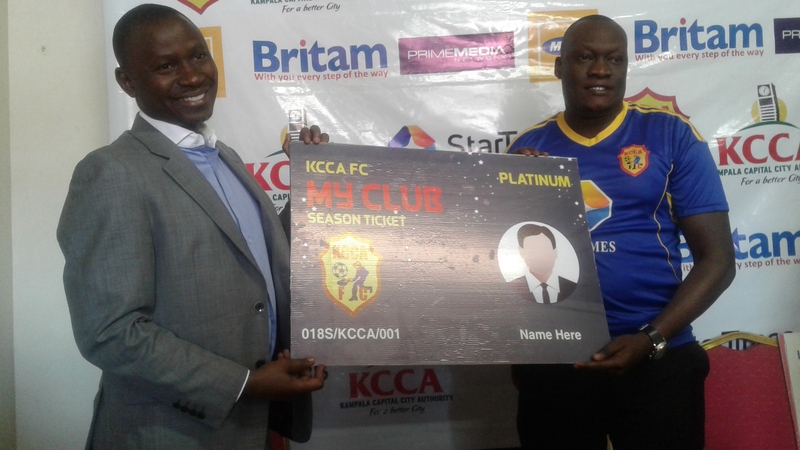 LUGOGO – Just weeks to the start of the season, KCCA FC have officially come out and launched their season tickets for the 2018/19 campaign. This was during a press conference held at their home in Lugogo, hours after their team lost 4-3 away to Esperance in the CAF Champions league. The rates of the tickets have not changed but the Uganda Cup holders have introduced a new ticket which will enable University students pay to watch all home games at Shs 50,000. Speaking at the launch, the Chairman of KCCA FC, Aggrey Ashaba said that they had to wait for the end of their 2017/18 season to launch the new tickets. “We are now in position to launch our season tickets after the closure of the last season, said Ashaba in a press briefing on Wednesday morning. “We decided to wait until the final game in the CAF Champions League so as we go on with the launch. “Season tickets is one of the ways to try and generate further revenue and also promote pre-payments for football games. “Not much has changed from last season, the values and benefits are more of the same, continued Ashaba. “We just have a few additions where we felt like we want to give back to the people who believe in the club. “We are introducing a couple of new items and one of them being the fact that if one buys a season ticket, you can bring another on board to watch the games as long as that person is below 12 years of age. “We are also introducing a ticket for students and we want them to come in huge numbers. “The other thing is that we offering discounted rates for our ‘Visit Kampala Jersey’ as every season ticket holder will purchase the Jersey at a 50% discount. Also speaking at the launch, KCCA FC CEO, Josephine Namukisa promised that most of the major complaints from last season including a media zone will be taken care of during the course of next season. -Access to all home games at the VVIP platform through forest Mall gate. -Priority service during home games. -Discount of 10% on all club merchandise. -Come with one child below 12 years. -Free access to friendly games. -Access to all home games at the VIP platform through the main gate. Priority service during home games. Discount of 5% on all club merchandise. -Plus one (child below 12 years). -Access to all home games at the ordinary side through Naguru Hospital gate. -Discount of 5% on Club Merchandise. -Plus one child (below 12 years). -Access to all home games at the ordinary side through the Naguru hospital gate.